For a few years in the late 1980's Boston Whaler offered the option of powering some of its larger models with the OMC Sea Drive. Here is a look at the Sea Drive and the conversion to more conventional power on a nice Boston Whaler WHALER-27 from the mid 1980's. As early as 1982, OMC began to offer its two-stroke outboard motors mounted in an innovative self-contained stern bracket and tilt mechanism which was called the Sea Drive. The Sea Drive was made in a number of conventional two-stroke engines of various displacements. A V-4 engine of 1.6-litre displacement produced about 100-HP. V-6 engines in displacements from 2.6-litres to 3.0-litres were rated around 185 to 225 HP. These horsepower ratings are more or less deduced from equivalent outboard models, as the Sea Drive engines always seemed to be marketed only with their displacement specified. The Sea Drive was an alternative for both inboard/outboard (stern drive) power and for bracket-mounted outboards, which were just becoming popular at that same time. Production continued into the early 1990's. In development of the Sea Drive, OMC reportedly used a 25-foot Bertram as a test boat. A boat rigged with Sea Drive engines was compared to a boat rigged with conventional inboard Ford 302 V-8 engines. The Sea Drive boat was about 10-MPH faster, used less fuel, and was quieter. The earliest models of the Sea Drive provided a snorkel for air intake which ran in a rubber hose back through and inside the transom. This avoided problems with swamping when backing down in heavy seas. 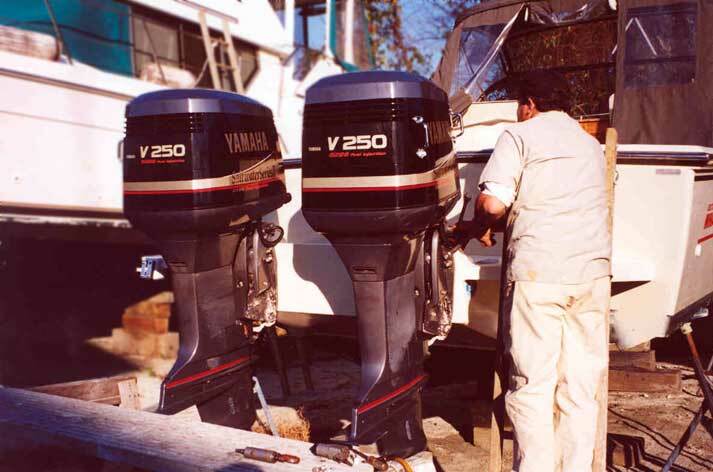 Outboard engines mounted on the popular Gill Bracket of that era often had problems from ingesting water, and OMC warned against use of their standard outboards in those applications. The snorkel also cut down on noise. Some early models also featured electrically powered oil and gasoline mixing, the "Economixer". This was an expensive option and did not prove to work that well. It was often disconnected in use, and soon was dropped from production. The Sea Drive bracket was quite nicely engineered and over built. It was also rather expensive. As the Sea Drive evolved, improvements added weight, complexity, and cost. Rigging required special cut-outs in the transom and other complex installation. 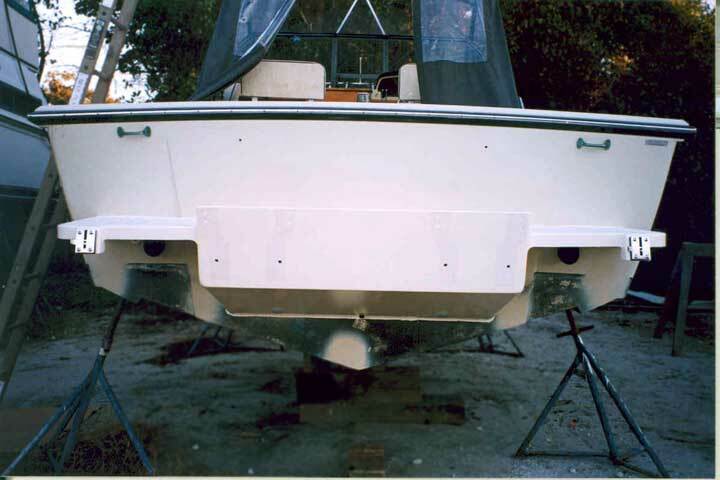 In contrast, more conventional brackets could just be bolted on and rigged with standard outboards in much less time and for lower cost. Popularity declined, but production of the Sea Drive continued into the early 1990's. 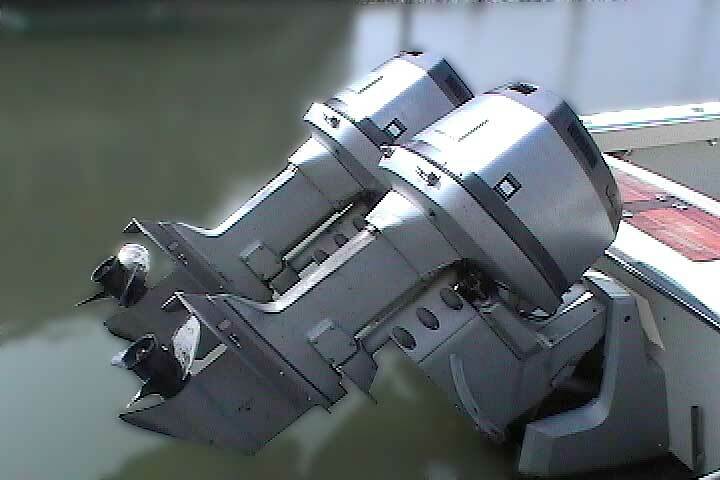 Eventually OMC dropped the Sea Drive, and went on to other ventures, such as the jet drive adaptation used in the Boston Whaler RAGE series. The Sea Drive worked quite well in its day, and it attracted the notice of Boston Whaler. Although, with the benefit of hindsight, many speak ill of the Sea Drive, its association with Boston Whaler as a factory supplied option might be considered an endorsement. Sea Drive power was first offered as an option on Boston Whaler boats in 1985. A Sea Drive has been seen installed on a Whaler as small as an OUTRAGE 18, but usually they were ordered on larger boats. The 25-foot and 27-foot models are the most frequently seen with Sea Drive installations, as well as the occassional 22-foot hull. By c.1988 the Sea Drive was no longer seen in the Boston Whaler catalogue. During its brief run, however, the Sea Drive must have been fairly poplular, as many Boston Whaler boats from this era are seen equipped with Sea Drives. The Sea Drive was often installed in pairs on larger boats, where more total horsepower was needed. As the engine was a conventional two-stroke cross-flow, it was not noted for being easy on fuel consumption, particularly when pushing around larger boats. Most of these large twin engine installations were made on boats intended for offshore use in salt water. Since the oldest Sea Drives are now entering their twentieth year, in most cases they are at the end of their useful life. Even Sea Drives pampered in seasonal fresh water use are often ready for replacement. In addition, the advent of much more economical four-stroke or direct-injection two-stroke outboard engines has also provided an incentive to replace the Sea Drive on larger boats. The Sea Drive was an innovative idea, but OMC discontinued it in the early 1990's. They stopped providing support and parts a few years later. Currently, repair parts for the mounting and tilt system are not easily available, although the engine can be serviced with standard outboard parts. As a result, when a Sea Drive engine fails, the usual cure is to replace it with a conventional outboard mounted to an engine bracket. Replacement of a Sea Drive installation with a conventional bracket and outboard is quite a project. This fact is not lost on potential buyers. Often very nice Boston Whaler boats available in the used market experience a tough sale because they are equipped with Sea Drives. The used Sea Drive models generally sell for less than a comparable conventional transom or Whaler Drive model. On the other hand, if you are willing to undertake the re-fit project, a Sea Drive equipped Boston Whaler can often be initially the least expensive way to purchase a desirable classic Whaler hull, particularly in the larger models. Mark documented much of the conversion process with photographs, and includes these comments. "The following pictures show the continued process of re-powering my WHALER 27 with a cusom-built engine bracket. The bracket has an overall width of 100-inches and is designed for mounting the engines on 36-inch centers on a transom with a 13-degree angle. The bracket was custom fit with notches to clear the scuppers and to match the template I provided (which detailed the Whaler transom where the center portion protrudes an inch or two). I also ordered it with mounts for a dive ladder. "I decided to go with Stainless Marine for my bracket because they use a heavier gauge aluminum than Armstrong and they powdercoat as opposed to paint. Stainless also includes backing plates, bolts, a clear plastic template, and installed zinc sacrificial anodes. With the swim platforms, dive ladder and mounts, custom engine centers, custom notch to match the transom, and an overall width of 100-inches, the bracket cost $3100 (wholesale! ), a little less than what Armstrong quoted. 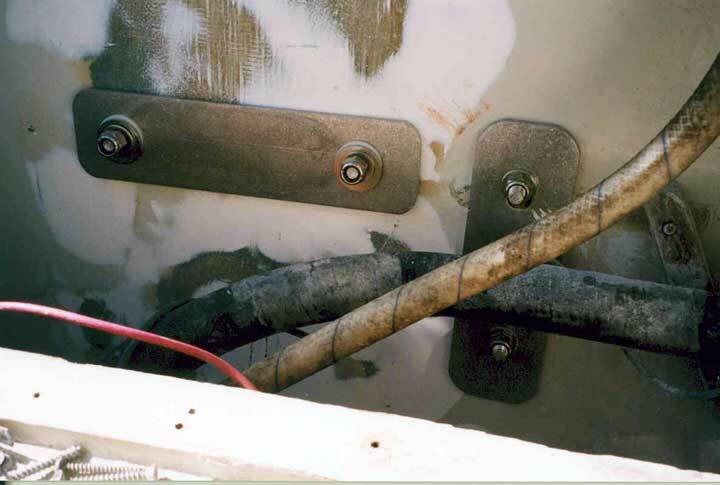 Fortunately, none of the bolts will have to pass through any of the patched areas of the transom, and because of the way Stainless builds their brackets, I no longer have interference with the scuppers. 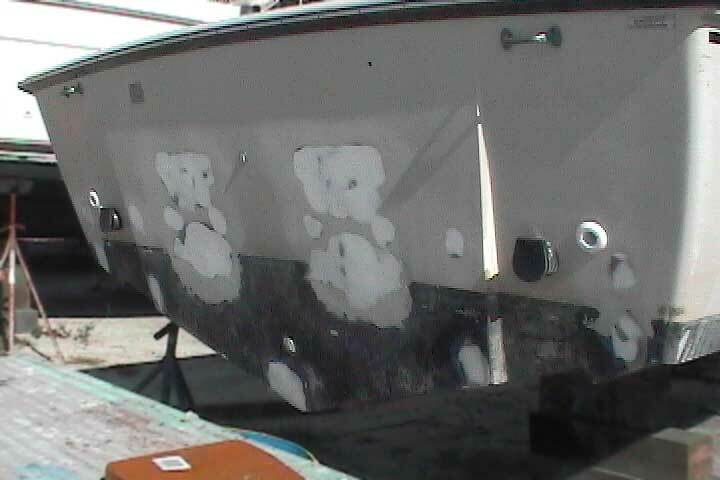 "The boat yard finally got decent weather and was able to gelcoat the transom. 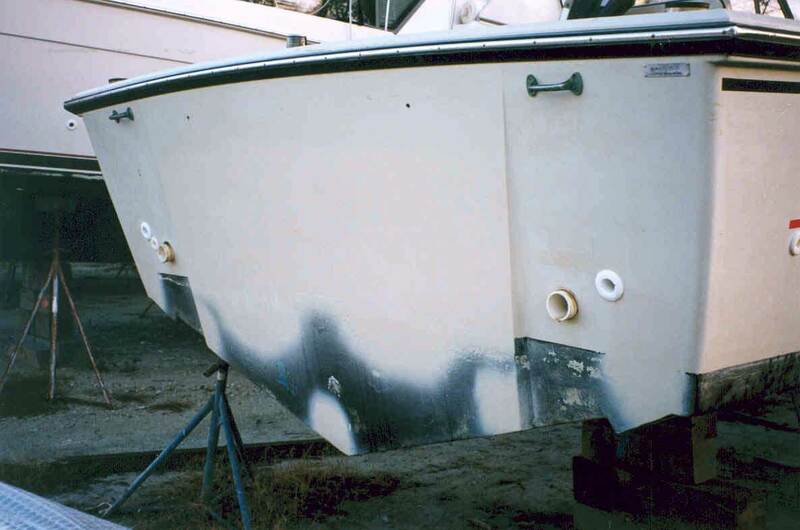 The Spectrum gel coat resin was a litter darker than the boat, and a line can be seen (although not apparent in the digital images). Wet sanding the entire transom really brought the old gel coat back to life and helped blend the new. I intend to wet sand, compound and wax the entire hull from the waterline to the rub rail. If you look closely, you can see some old stickers under the hull number plate before the wet sanding and after. "I decided to install the bracket myself, to save money and to ensure it was done properly. The first step was to compare the provided template to the bracket to be sure the holes matched. Once confirmed, I re-measured to find the horizontal template line and taped the clear plastic template to the transom. With a 1/4-inch bit I began drilling pilot holes. Luckily they all cleared any potential obstacles, and I drilled them out with a 17/32-inch bit for the 1/2-inch stainless bolts. With the help of my brother-in-law, we lifted the bracket onto saw horses and eased it up to the transom to be sure it fit around the notches. Once the fit was confirmed, I put a heavy bead of 3M5200 around all bolt holes and around the mounting face of the bracket to prevent water intrusion. We bolted the center two bolts and backing plate, which were enough to carry the bracket, and kept bolting from there. Several backing plates had to be trimmed with a Saws-All to clear the stringers. After numerous rounds of tightening we had it pulled up tight and secure. It took two of us about six hours to complete. Finally, I ran a bead of 5200 around the entire bracket. 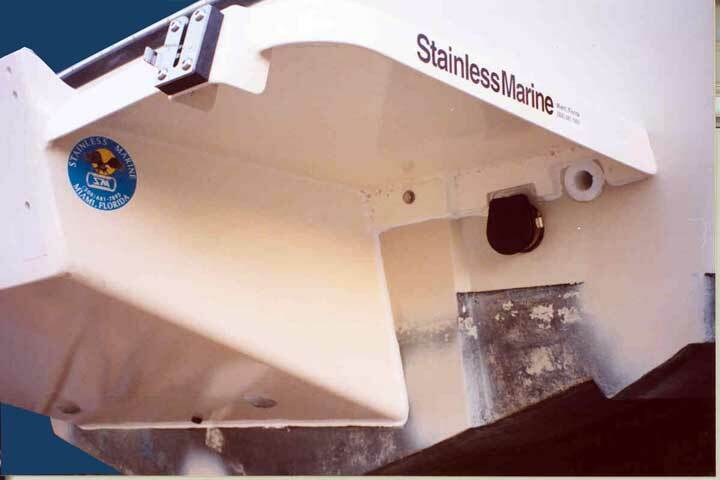 "I am very impressed with Stainless Marine; they built a beautiful bracket. It has a great looking powder coat and non-skid, and includes quality installation materials. "Once the bracket was mounted I had my new engines bolted to it. Stainless even provided an adhesive barrier to separate the dissimilar metals of the bracket and engine, as well as nylon washers for the bolts. "This brings us up to January 2003. I had the boat yard put the Whaler on a nice triple axle trailer and towed her home where I will complete the engine installation process." The WHALER 27 with a pair of OMC Sea Drive 2.6-L engines was shipped from Quincy, Massachusetts to Halsey Cannon Boat Yard on the Wando River in South Carolina. The Sea Drive was quite innovative when introduced in the 1980's. In provided an integral engine setback bracket and tilt system. The V-6 outboard engines were 2.6-litre conventional two-strokes. By locating the tilt pivot axis at an elevated height, OMC was able to conserve space needed for the engine when tilted. Instead of protruding into a transom splash well, the engine remained outside of the boat. In this way the space normally allocated for a splash well could be returned to the cockpit for other uses. After the OMC Sea Drive engines were removed, the boatyard shop restored the transom. 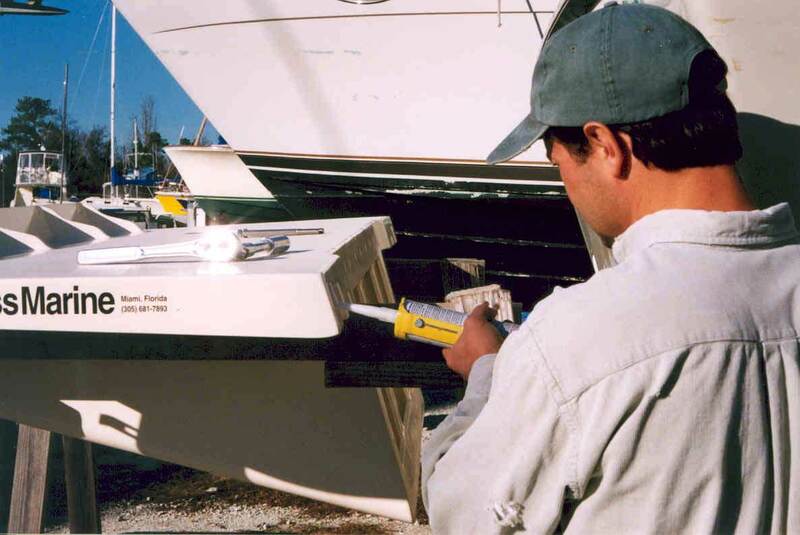 The Sea Drive installation required special cut-outs be made in the transom. Unfortunately, no photographs of the repair work in progress are available. The repaired areas are larger than the actual holes so that the repair can be feathered in. 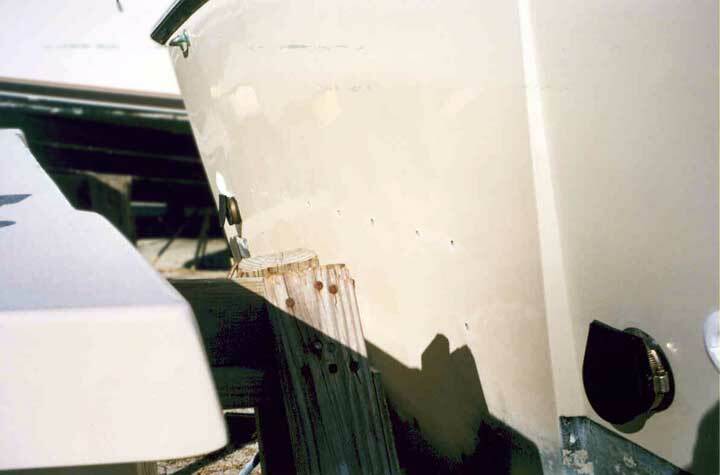 The Whaler transom is not flush, and the approximate two-inch offset can be seen in the center portion. The bracket had to be custom fabricated to wrap around the center section. The inboard side of the transom is must also be restored. Instead of an open splash well, this Whaler will have a nice stern lazaret compartment which can be used for storage. The oil reservoir tanks and batteries are also usually located here. The keeps the wiring and hoses out of sight and reduces the clutter on deck. Application of new gel coat conceals the repairs. 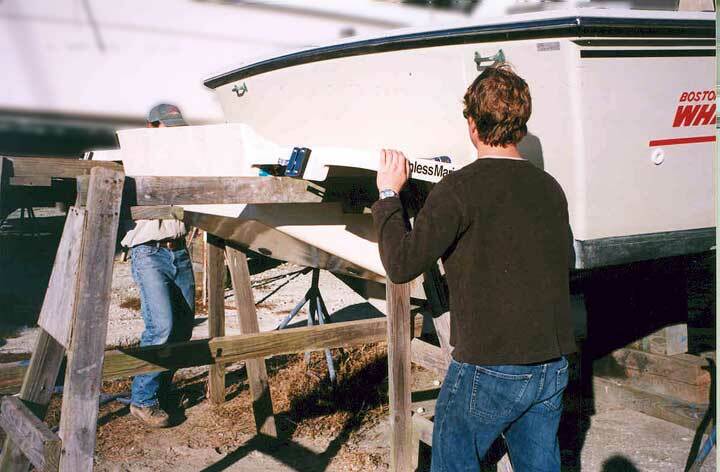 The transom has been carefully marked and drilled to accept the mounting bolts of the new Stainless Marine setback bracket using the provided template. 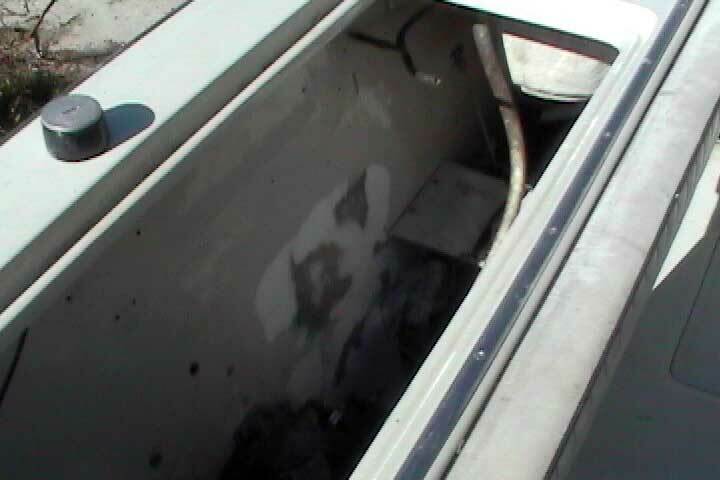 As it turned out, none of the mounting bolts were located in areas of the transom that were part of the repair from the Sea Drive installation. 3M5200 sealant/adhesive helps to secure the bracket and keep water out. Mark applies an ample bead to the bracket. The custom-built bracket is carefully fitted to the transom. Mark and brother-in-law Dylan are able to handle the weight. I hope there is someone hidden in the boat to tighten those first bolts! Careful measurements and custom fabrication allow the bracket to fit perfectly among the existing obstacles on the transom. All Boston Whaler full transom boats have large scuppers to drain the transom compartment should the cockpit become filled with water. The through-hull fitting is the exhaust from a sump pump. On the inboard side of the transom the engine bracket is through-bolted with generous mounting plates to spread the load across the refinished transom surface. The bracket is now ready for new outboard engines. Hulsey Cannon Marina mechanic Earl inspects the pair of Yamaha V-6 Saltwater Series 250-HP outboards attached to the new bracket. A great deal of additional work remains. New hydrailic steering, mechanical shift and throttle, electrical control cables, ignition switches, gauges, and battery cables all have to be fitted and installed. More photographs are in the works, and we will see the rigging process, plus the all-important final results. Check back for updates. The page has been accessed 55004 times.